Are you going to give us tips for this spring>>>>going into summer? I was shopping yesterday for some new nice weather clothes and I am not sure how to dress it up? I found some great layering tops(with ruffles and buttons in the front, and a spring military coat to layer over, but that is it). I am good with cooler/winter weather and using scarves and belts for layering...but when it gets hotter-then what?! Pretty soon it will be 90 out and I will not be able to layer as much as I do now. I still want to look nice and put together! Help!" ~Krystal F.
Tip 1) Structure is EVERYTHING!!! If we are layering less and ultimately wearing less clothing, we want to feel good in baring our bodies a bit more than we had in colder weather. Don't scream and run away at the thought (most of us put on 5-10 lbs. during the winter months, and that's okay! ), just hear me out. When you wear clothes that give you good structure, meaning they help dictate and accentuate your shape, your eyes are drawn to all the right places. This means being VERY particular on what you add to your spring/summer closet. Think of items that have a built in waist and an open neckline. Find higher quality fabrics like cotton instead of flimsy fabrics like jersey. Below are some items that have structure and will look nice on their own. 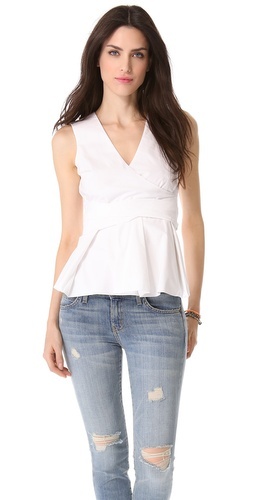 This top has a nice built in waistline and an open neckline. It can definitely stand alone without help from a belt or other layering items. Again, a great structured piece that will give you a nice shape with any top or blouse tucked into it. This blouse is a nice sheer fabric that will let you feel the breeze on hot days. It gives good shape to the body because it ties in the back. These are a classic crop pant and will be in style for a LONG time. Pick solid colors if you want them to stay in your closet awhile ;) They should have a crease down the front! The color really doesn't matter, just have at least one high quality pencil skirt in you closet at all times! Great with flats or heels, button down or tank, blazer or cardigan. Female designers tend to know how to flatter a woman's body. I wanted to share this tank because of it's flattering construction. Tip 3) Dresses are FABULOUS! A classic shift dress. PERFECT for a pear, hourglass, or rectangle body shape. A sweet V-neck fit and flare dress. Flattering on most body types, particularly pear, apple, and inverted triangle. Shirtdresses feel casual while looking put together. 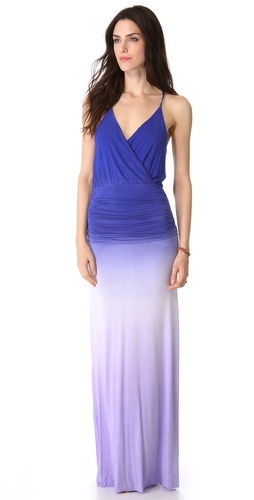 A dress like this would be flattering on all body shapes. Dresses can be dressed up or down easily by changing flats to heels or a blazer to a cardigan. Jewelry and handbags can also change the look up quite a bit. Tip 4) Accessorize... A LOT!!! Want the outfit you wore today to look completely different tomorrow?! Change your shoes, jewelry, and handbag. I promise, it WILL be a whole new outfit. Sweet, easy, and work appropriate. These would be so great with a flouncy skirt. This would be perfect to wear with a tee or layering with other delicate chains. This is a GREAT shoe if wearing heels typically hurt your feet. It would look great with shorts, crop pants, skirts, and dresses! Okay...you can stop drooling all over your keyboard. I know how you feel, nothing but LoVe for this little number ;) It would even dress up a simple tee. This beautiful oversized clutch stands alone. It will pop off all your neutral items and plays well with other colors. I really like that is has a shoulder strap too. Tip 5) You can still layer! **Bonus Top Tip** Just a reminder, the most flattering sleeveless tops, tanks, or dresses have a thicker strap. Look for something around 2 inches thick, perfect as well for discreetly wearing a well supportive bra. Avoid spaghetti straps unless you have small a bust line and shoulders. Short sleeve blouses and tees should have a "full sleeve". Cap sleeves broaden shoulders. This post was FULL of info! See what happens when you ask questions?! That totally inspired me, THANK YOU for your questions Krystal F!!! I hope everyone feels more equipped for summer shopping and dressing. Now get out there and have some fun! Thank you so much for reading.